(WASHINGTON, DC, October 26, 2018) – Throughout the month of October, Cruise Lines International Association (CLIA), the unified voice and leading authority of the global cruise community, is encouraging travelers to #ChooseCruise and learn more about the cruise industry. In honor of Make a Difference Day (October 27, 2018), CLIA is highlighting some of the most innovative initiatives cruise lines are taking part in to help make a difference at sea and beyond. Donations & Partnerships: One main way the industry makes a difference globally is through charitable partnerships and donations, monetary and otherwise. Costa Cruises, in partnership with the Francesca Rava Foundation, has built the Costa Crociere Foundation to assist rebuilding Norcia, Italy, after the earthquake of October 30, 2016, which damaged the town’s schools. In the immediate aftermath of the earthquake, Costa started donating one Euro for every Amatriciana pasta dish served at its onboard restaurants. Guests also were able to make donations in support of the project that helped rebuild the town’s schools. Carnival Cruise Line works in partnership with St. Jude Children’s Research Hospital to support the organization’s many lifesaving initiatives through innovative fundraising efforts both onboard and ashore. Since the partnership began in 2010, Carnival has raised more than $16 million for St. Jude. Community Outreach: Many cruise lines support the local communities they sail to with a wealth of humanitarian efforts that give back to the resident economy. Holland America Line, working in cooperation with Fathom Impact Travel, offers a specialized Cruise with Purpose EXC Tours that give guests the opportunity to make a difference. One tour takes guests to the Puerto Plata community of Amber Cove, Dominican Republic where they participate in a hands-on visit to a chocolate factory founded by local enterprising women working to support their families. Paul Gauguin Cruises promotes sustainable travel to the island communities the line cruises to. With itineraries designed around the mission of giving back to local residents and supporting the local economy, the line encourages travelers to experience the local communities each trip visits. Paul Gauguin offers guests a chance to immerse themselves in the community by learning bark weaving and plant conservation from locals in the botanical gardens; boosting the economy in the local marketplace; and responsibly exploring ancient temples, pineapple plantations, and locally owned black pearl farms with local guides. Avalon Waterways partnered with Landmine Design which is a social enterprise that uses dignified work and design to educate and provide jobs for women living in poverty in Cambodia, one of the destinations Avalon Waterways guests visit along the Mekong River and home to a small village that is the site of the largest concentration of landmines in the world. Landmine Design was created to give women in the minefield a chance to make a living from their homes by creating and designing jewelry. For the past three years, Avalon Waterways (and the Globus family of brands), has helped this program grow from fewer than 10 women to 24 women. Educational Efforts: Cruise lines choose to make a difference by educating their cruisers about different cultures around the world and brining education to global communities. For example, AmaWaterways sponsors the ODA Free Village English School in Siem Reap, Cambodia. The school was established in 2011 in association with Opportunities of Development through Art (ODA). The cruise line’s support of the school brings critical English-language skills to local children to help improve their lives and support their success. Celestyal Cruises actively supports the local communities in the destinations it visits, particularly in the field of education. Since 2015, more than 1,200 students on the Greek islands of Milos, Patmos and Ios have attended specialized educational programs, initiated by Celestyal Cruises and the line supports cultural NGOs to promote youth entrepreneurship, marine student development and child welfare. At-Sea Sustainability: One major way the cruise industry aids in a global positive impact is by constantly striving for sustainable travel solutions. From clean tech to bans on disposable items to recycling efforts, nearly all cruise lines are constantly updating their sustainability practices. For instance, MSC Cruises is heavily invested in cleaner emissions and other environmental technology solutions including LNG-powered cruise vessels that create cleaner exhaust and produces energy with approximately 20% less CO2 emissions. The line is also investing in Selective Catalyst Reduction systems, an innovative solution that helps reduce nitrogen oxide into harmless nitrogen and water through advanced active emissions control technology. To cut down on disposable waste, when Virgin Voyages launches its first ship in 2020, there will be an onboard policy that bans all single-use plastics including plastic straws, bottled water, shopping bags, beverage stirrers, and more. Those looking to book a cruise during #ChooseCruise can find a CLIA-Certified Travel Agent at https://www.cruising.org/cruise-vacationer/cruise-travel-guide/clia-agent-finder. Cruise Lines International Association (CLIA) is the world’s largest cruise industry trade association, providing a unified voice and leading authority of the global cruise community. The association has 15 offices globally with representation in North and South America, Europe, Asia and Australasia. CLIA supports policies and practices that foster a safe, secure, healthy and sustainable cruise ship environment for the more than 27 million passengers who cruise annually and is dedicated to promote the cruise travel experience. Members are comprised of the world's most prestigious ocean, river and specialty cruise lines; a highly trained and certified travel agent community; and cruise line suppliers and partners, including ports & destinations, ship development, suppliers and business services. The organization’s mission is to be the unified global organization that helps its members succeed by advocating, educating and promoting for the common interests of the cruise community. For more information, visit www.cruising.org or follow Cruise Lines International Association on CLIA Facebook and Twitterpages. (WASHINGTON, DC, October 15, 2018) – This month, Cruise Lines International Association (CLIA), the unified voice and leading authority of the global cruise community, is inviting travelers to #ChooseCruise and celebrate the cruise industry. On Boss’s Day (October 16, 2018), CLIA is recognizing the powerful, influential women in leadership roles throughout the cruise industry. Kristin, Karst, AmaWaterways: AmaWaterways executive vice-president and co-owner Kristin Karst is a charismatic, entrepreneur leading her teams by example and following what she calls her four pillars for success: positive thinking, passion, partnerships and personal interaction. 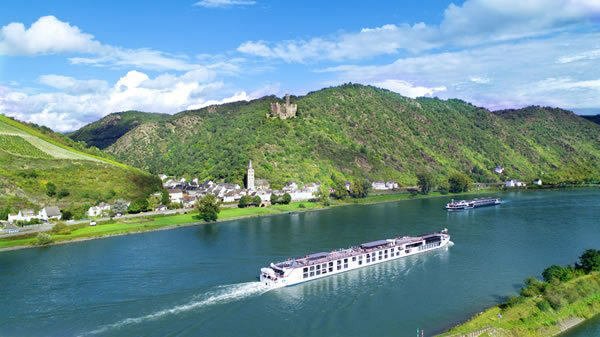 Pamela Hoffee, Avalon Waterways: In 2018, Avalon Waterways announced that Pamela Hoffee was taking the helm as Managing Director, overseeing all-things river cruising for the company. For 15 years, Pam has led product and operations for the Globus family of brands. As the NEW managing director of the company, Pam will steer this leading river cruise company into the future, supported by a team across the globe. Christine Duffy, Carnival Cruise Line: Carnival employs some of the most talented employees in the cruise industry, all led by President Christine Duffy who oversees more than 40,000 employees both on board and ashore across 26 ships. Jackie Chase & Jamie Paiko, Cunard Line: Cunard’s North American marketing team is helmed by two women: Director of Public Relations Jackie Chase and Senior Director of Marketing Jamie Paiko. Diane Moore, Paul Gauguin Cruises: Recognized as a leading expert in the industry, Diane Moore joined Paul Gauguin Cruises in 2010 as Executive Vice President and was later promoted to President. Diane has more than 40 years of cruise and travel experience. Those looking to book a cruise during #ChooseCruise can find a CLIA Certified Travel Agent at https://www.cruising.org/cruise-vacationer/cruise-travel-guide/clia-agent-finder. Cruise Lines International Association (CLIA) is the world’s largest cruise industry trade association, providing a unified voice and leading authority of the global cruise community. The association has 15 offices globally with representation in North and South America, Europe, Asia and Australasia. CLIA supports policies and practices that foster a safe, secure, healthy and sustainable cruise ship environment for the more than 27 million passengers who cruise annually and is dedicated to promote the cruise travel experience. Members are comprised of the world's most prestigious ocean, river and specialty cruise lines; a highly trained and certified travel agent community; and cruise line suppliers and partners, including ports & destinations, ship development, suppliers and business services. The organization’s mission is to be the unified global organization that helps its members succeed by advocating, educating and promoting for the common interests of the cruise community. For more information, visit www.cruising.org or follow Cruise Lines International Association on CLIA Facebook and Twitter pages. (WASHINGTON, DC, October 9, 2018) – The cruise industry is committed to sustainable travel through innovations that help to achieve clean air, clean water, preservation of marine ecosystems and sustaining local destinations. That is why during #ChooseCruise, Cruise Lines International Association (CLIA) is extending that mission and helping to educate travelers on how to be an ocean-friendly traveler. Pack Reusable Bags – Savvy travelers already know to leave extra room in suitcases for souvenirs and gifts. Green up shopping trips by packing reusable shopping bags and totes, then use them on visits to on-board boutiques and destination shops and markets. Choose Ocean-Friendly Sunscreens – Many sunscreens contain ingredients that may contribute to bleaching of our coral reefs. Help protect the oceans by avoiding sunscreens with active ingredients like paraben and benzophenone. Opt for reef-safe ingredients like zinc oxide and titanium dioxide. BYOB: Bring Your Own Bottle – A great idea for airport travel as well as cruise travels is to bring a reusable water bottler. Doing so helps reduce the number of plastic bottles that can take up to 1,000 years to degrade in landfills. Pro tip: leave the bottle empty until you get through airport security, then fill at one of the many water stations around most airports. Ditch the Straw or Go Metal – Straws and other disposable plastics pose a high risk to marine life. 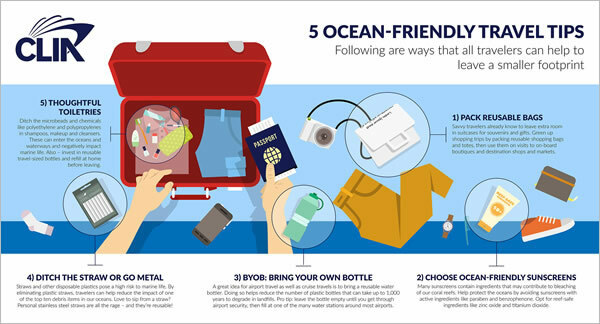 By eliminating plastic straws, travelers can help reduce the impact of one of the top ten debris items in our oceans. Love to sip from a straw? Personal stainless steel straws are all the rage – and they’re reusable! Thoughtful Toiletries – Ditch the microbeads and chemicals like polyethylene and polypropylenes in shampoos, makeup and cleansers. These can enter the oceans and waterways and negatively impact marine life. Also – invest in reusable travel-sized bottles and refill at home before leaving. For more information about booking a cruise with a CLIA-certified cruise specialist, please visit https://www.cruising.org/cruise-Vacationer/choose-cruise. Cruise Lines International Association (CLIA) is the world’s largest cruise industry trade association, providing a unified voice and leading authority of the global cruise community. The association has 15 offices globally with representation in North and South America, Europe, Asia and Australasia. CLIA supports policies and practices that foster a safe, secure, healthy and sustainable cruise ship environment for the more than 27 million passengers who cruise annually and is dedicated to promote the cruise travel experience. The CLIA Community is comprised of the world’s most prestigious ocean, river and specialty cruise lines; a highly trained and certified travel agent community; and cruise line suppliers and partners, including ports & destinations, ship development, suppliers and business services. The organization’s mission is to be the unified global organization that helps its members succeed by advocating, educating and promoting for the common interests of the cruise community. For more information, visit www.cruising.org or follow Cruise Lines International Association on CLIA Facebook and Twitter pages. (WASHINGTON, DC, October 1, 2018) – This October, Cruise Lines International Association (CLIA), the unified voice and leading authority of the global cruise community, is highlighting why travelers should #ChooseCruise. 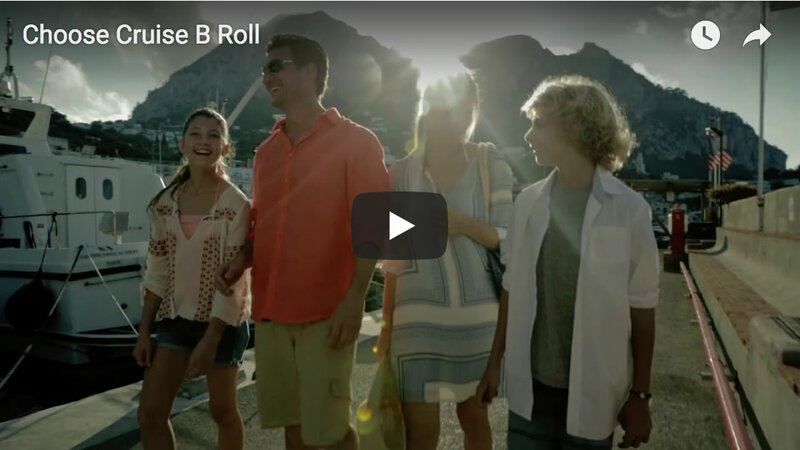 The initiative, formerly known as Plan a Cruise Month, will feature the latest information about cruise travel, the best deals and promotions as well as the cruise insights across the industry’s social platforms. With more than 27.2 million cruisers expected to embark on a cruise by the end of this year, these travelers can leverage the expertise of a CLIA-certified cruise travel agent to tailor a personalized cruise trip. Travel agents offer their clients real-world experience and industry insider expertise. Find a CLIA Certified Travel Agent at https://www.cruising.org/cruise-vacationer/cruise-travel-guide/clia-agent-finder. During #ChooseCruise in October, cruise lines are offering exclusive deals and promotions. Travelers can take advantage of these special deals through a CLIA Certified Travel Agent.